Rent a Downhill bike and explore Åre Bikepark, one of the world best downhill parks. On the mountain you will find over 30 trails with different difficulties. That takes you through mountain and forest terrain down to the lake. It has something both for the family and for the more experienced cyclist. 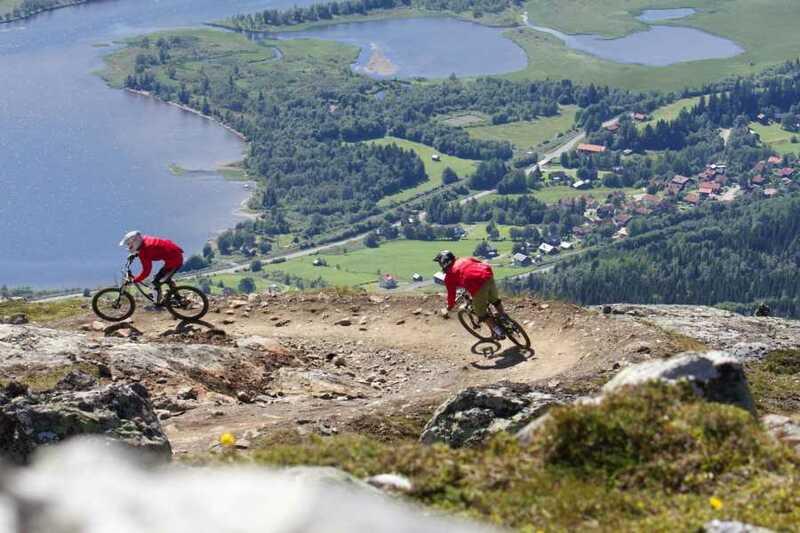 This easy to handle and fun downhill bike is perfect for going around on the machine made tracks in Åre Bikepark. It's fully suspension and light weight makes it easy to cross the most obstacle with ease. We recommend this bike all from beginners to the advanced cyclist. This downhill bike is heavier and more robust to manage all that the slopes have to offer, from the easiest tracks to the blackest steep. We recommend this bike to the advanced cyclist. Note that the cost to get up on the mountain is not included in the price. We recommend buying the cost reduction for damaged bike for the bike you rent. So you can feel at ease in the bikepark. Vi offer introduction courses during the first hour of renting. We highly recommend this for beginners. It will give a better experience for the rest of the day and make you feel more comfortable in the bikepark.